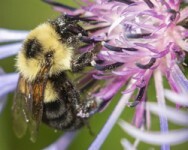 Registrants will receive the Xerces Society's Pollinator Conservation Toolkit which includes Xerces' book, Attracting Native Pollinators, as well as habitat management guidelines and relevant USDA-NRCS and extension publications. The content of this course is tailored to the needs of NRCS, SWCD, Cooperative Extension, and state department of agriculture employees, as well as farmers, crop consultants, natural resource specialists, non-governmental conservation organization staff, and producers of bee-pollinated crops. This short course is hosted by The Xerces Society and was made possible thanks to the support of the New York NRCS and the Cornell Cooperative Extension Harvest NY. Special thanks to CCE Harvest Urban Agriculture team for providing the venue for this event.